The Premier Group, a Control4 Certified Showroom Dealer located in Carmel, Indiana, was recognized as the CEDIA Awards’ top honor for “Integrated Home of the Year 2018” in North and South America for outstanding integrated system design at the 2018 CEDIA trade show in San Diego. The award-winning Geist Reservoir Home was the result of a successful partnership between The Premier Group and Gary Nance, an award-winning architectural designer based in Indianapolis. We wanted to shine some light on how The Premier Group and Gary worked together to create such a masterpiece, and so we sat down with Jamie Sangar, Director of Business Development for The Premier Group, to find out how the Geist Reservoir Home was born. What was it like winning Integrated Home of the Year? We first found out at the end of June that we had been selected as a finalist, which was remarkable in and of itself because being announced as a finalist means you are in the top three in North/South America. Receiving that news was probably equally as shocking as being announced the winner, to be honest! We feel like we have done high-quality projects for a really long time, but not once before have we submitted anything for the CEDIA Awards. The reason for that was simply the amount of time the submission takes, and not having a dedicated person to pull all of the photography and documentation together—the intention was always there; it was just never completed. So to be ‘batting 1000’ with the CEDIA Awards by being selected as the winner with our very first submission, the honor is both flattering and a testament to the high-level design and installation that we put forth on every project. As a team of smart home experts, how were you able to bring the architectural designer’s vision to life? The entire design team, consisting of Gary Nance (architectural designer), Brandy Ketterer (interior designer), and ourselves (technology designers) were in a handful of meetings together along with the client. By being a part of the design process, it allowed us to first hear Gary’s architectural vision, which then needed to be carried through with the interior and the technology. We use the phrase ‘protecting the design’ all the time in our office, and that means that not only are we protecting our trade partners design visions and expectations, but we expect the same to be reciprocated with our partners when it comes to our technology design. With this project, the design aesthetic overall was modern/contemporary, which means clean finishes and sleek lines. We designed a lot of accent lighting to accentuate the architectural focal points (things like the lighted steps, in-cabinet and under-cabinet lighting, cove lighting, uplighting in the basement bar on the dimensional tile wall, and under-counter lighting used on the kitchen island and on the bar in the golf simulator room). With these lighting details, we automated it all into lifestyle scenes and/or an astronomical clock that knows when sunrise and sunset times are in Indianapolis all year around. What was the working relationship like with the designer? Most of our work with the entire design team happened upfront prior to construction starting. This allowed us to hear the design direction firsthand from everyone, and then we had the information that we needed to pull together what we felt like was the best plan for the homeowners. Each trade had the reputation for being the best in their field, so the majority of the design was left up to each individual team that then worked with the homeowners to get their input and final blessing. What was your favorite part of the Geist Reservoir Home? If we had to pick just one part, we would have to say the TV installations throughout the entire home. Each one is hung on a finish other than drywall, which added some logistical challenges. There were so many different wall finishes including concrete, varieties of stone, and wood planks—and the best part about collaborating with the design team on this was understanding the finishes ahead of time during the planning stage, and working with the framers to make sure that we would be able to recess every single television into the wall, no matter the finish material. It’s something the average person may not pay much attention to, but that’s because it’s such an elegant installation method that keeps with the sleek lines and minimal interiors. No one’s eyes are drawn to a TV slapped on a wall. Rather, it just blends in very tastefully. 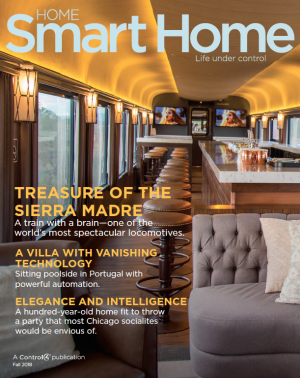 What advice do you have for interior designers, architects, or builders wanting to learn more about smart home technology? The absolute best way to learn about smart home technology is to actually experience it firsthand. We have an amazing showroom inside our Indiana showroom. Our showroom allows us to use examples that make it personally applicable to an individual’s lifestyle based on their family makeup—for example: kids, no kids, pets, granting access to house cleaners, pet sitters, etc. Understanding the difference between being able to individually operate each piece of technology that’s integrated into the controller and then experiencing it being used as a part of a ‘scene’ is always eye opening for anyone that sees it for the first time.